The Ellen M. Egger Quartet of instruments is featured on the Alexander String Quartet's 2009 recording of the complete Beethoven quartets (3 volumes, 9 disks). I like a bold look. This is reflected in the sound of the violin. 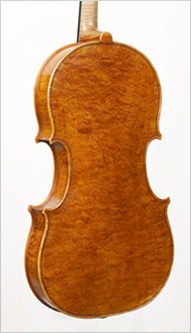 The outline is derived from a late Guarneri, its form evolved with repetitive use. Choice of wood, full archings, "samurai" f-holes and relative flexibility/tension determine its voice. Powerful, with full range of color and reserve. My violas go back to Mantua and Camillus Camilli for their inspiration. A broad middle bout gives depth and power to its sound. Varying body lengths provide a maximum of comfort with a full array of tonal possibilities. 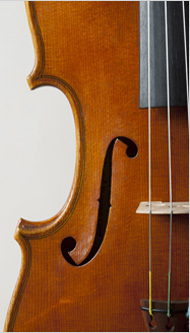 Cellos by Francesco Ruggeri and Antonio Stradivari provide a good starting point for my smaller and larger models. 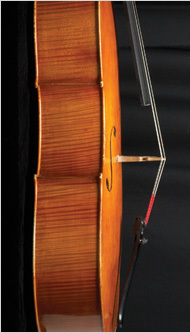 The broad yet compact Ruggeri is "user friendly" with no loss in power and complexity, while the larger modified B-form Stradivari (as played by ASQ) offers a nobility in tone to cellists accustomed to its greater length.